The Okoboji Lakes look inviting, all right. The Midwest farm state of Iowa is so proud of its string of blue-water lakes - the Okoboji Lakes - that it calls them “Iowa’s Great Lakes.” They’re ringed by resorts, marinas, and fishing cabins. And they’re very real. We point that out because not everything is real in those parts. 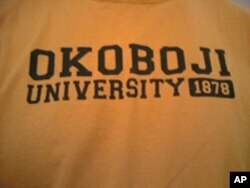 Most notably: the renowned, but quite mythical, University of Okoboji. All over the world, you bump into people wearing University of Okoboji caps and sweatshirts. In fact, a U of O pennant - with its impressive crest showing the Iowa Great Lakes - was once planted at the South Pole. 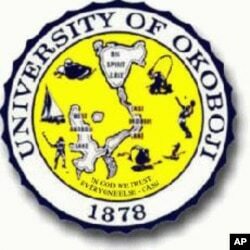 The impressive seal of the Great University of Okoboji. We kind of think they made up the 1878 date, however. The legendary University of Okoboji football team, the Fightin’ Phantoms, plays three powerhouses - Notre Dame, the University of Nebraska and the winner of the University of Iowa versus Iowa State game - on a single day, September 31. That’s right, September only has 30 days. So far, the Phantoms have won every game. The make-believe University of Okoboji was conceived 36 years ago by brothers Herman and Emil Richter, who own a clothing store in the nearby town of Milford, Iowa. As a lark, they printed U of O T-shirts, and people snapped them up. Today, you can also get University of Okoboji mugs and sweatshirts that are every bit as impressive as those from Stanford or Yale. Former president George W. Bush was even presented with the university’s cap and gown. Not the usual mortar-board cap with a tassel and not a heavy robe. Okoboji’s cap and gown are a golf hat and a beach towel. People who’ve been there during the deep freeze of an Iowa winter swear they saw Jack Frost and Santa Claus throwing snowballs by the lake.